Keeping track of all the props requested by both the designer for the visual appearance and by the director for the action of the play is the responsibility of the properties director. This is managed through the use of a prop list. The prop list should have every prop named as well as listing any details the properties director requires to track the prop and keep as information about it’s use or look. The page number, just as in the preliminary prop list, connects the prop being worked on to the specific page number to allow the artisan to cross check information given in the script. This is especially important when working on paper props where dialogue may be “read” from a letter or document. Copying exactly what is written in the script keeps the actor focused on the scene and prevents distraction. The tracking number is a simple tool for organizing the prop list. Many regional theatres use a numbering system, assigning each prop it’s own number allowing for effective tracking of the prop on all subsequent communications from rehearsal reports to build notes, load-in sheets, run-sheets, etc. As props are added, each is assigned a number. Deleted props retain their number since all too often they return later in the process and can be easily added back in. Non duplication or reassignment of a number also prevents confusion especially when prop lists are updated between the departments. For further explanation of how a numbering system is utilized, please read the sub topic . Some prop shops do not utilize a numbering system because the builds are small or do not require this level of organization. Do what works for you. If the numbering system helps, work with stage management to make it a useful organizational and communication tool. Decide how you will assign numbers and communicate the information making it part of the rehearsal notes and tracking system for prop run. This is simply another tool to bring clarity and organization to the list. The item column holds a simple listing of each individual prop such as broom, chair, knife, or digital phone. This prop name should be kept the same in all areas of communication. Sometimes when duplicate items are used a more personal name is given to a common item such as “Grandpa shovel” and that name tracks through both the prop list and stage management lists. Keeping the item names unambiguous promotes effective communication. Connecting a prop to a specific character/actor or a particular “function” or “action” also helps clarify which prop the list is detailing. This may be where information on “consumable” props may be included, as well as notes communicating any idiosyncrasies of a particular item, for example: "fragile", or "lid pops off when dropped" or "not structural for standing on". It is also a handy place to note when a particular actor known for his physical use of props will be handling the prop. Entering the character name for hand props is especially helpful if the need to sort out hand props by individual occurs. For example, to find all the hand props for the character “Cyrano” the prop list can be quickly scanned for every entry in the column with that character name. Then a list can be made allowing everything the actor playing Cyrano uses to be compiled and the props organized for rehearsal use or prop check-in by character. A full description based on the information from the prop meeting with the director and designer (quantity, how it is used, color, size, detailing, etc.) and information on any research included in the “bible” should be notated in the column for "description". Not all information needs to be included but the listing should make the connection to whatever drawings, photos, research or other finalized information is available. It is especially helpful to include sizing information as a quick reference guide instead of having to sort thru the research pages for that information when out shopping and needing to take measurements or in a meeting with stage management or others and a question comes up about a particular piece. This area might also note any questions about the prop needing to addressed to the designer or director. The prop list description also shows where overlap and collaboration with other departments occurs. For example, a chandelier requires the lighting department to run an electric cord for the needed power and the scenic department to rig a hanging line to suspend the fixture. The coordination of the project should be noted on the prop list to allow for adequate consultation between all areas. The prop list description area might have timelines noted for when the piece needs to be in rehearsal or when it must be completed to a certain stage for sending out to a specialty shop. As a management tool, the prop list also may have assignments for completion and a preliminary guesstimate how the prop will be completed (build, buy, borrow, pull). Putting artisan names to particular props allows the properties director to balance the load across the shop, see where collaboration is needed, or determine if a specialist / over hire situation is needed. Listing how the prop will be completed also shows where the shopper and the artisan must coordinate activity, the priority for pulling or finding props, and the obvious purchases the budget must allow. These definitions may change but it gives a start to organizing the entire build. It is also easy to pull out each artisan’s work list once names have been assigned or to create a BUY list for the shopper, a PULL list for the artisan going to prop storage, and a BORROW list of the things that need to be found in the community at other theatres or organizations. Lastly, it’s helpful to have a status column that notates when a prop has been sent to rehearsal or is presently in rehearsal, and what stage of completion it may have reached. When most props have been checked-off in this column, the properties director knows that many of the difficulties arising from first time prop use will have already been solved by using the prop in the rehearsal hall before arriving onstage. It can also be a handy place to simply note “RP” for “rehearsal prop” to track when a similar item has been sent or is being used in rehearsal instead of the real item. Colors are used to show “adds” and new information. Click to move to next “chapter” : The Build Process. 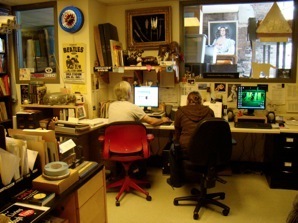 Milwaukee Repertory Theatre prop office with Prop Director Jim Guy working on research and organization with his assistant. Click on links below to see more examples of prop lists / formats.